Summer is here (where I live at least) and that MEANS IT’S barbeque or barbecue season. So, as a proud Canadian, my family decided to host a barbeque for our family and friends to celebrate Canada Day (or we just used the holiday as an excuse to get together). Nevertheless, my family and I have been preparing drinks and food for the event. I was reading the Canadian Living magazine at work one day (don’t ask me why I have the time to look at magazines when I’m working) and came across two types of lemonade recipes. During the past two weeks, lemons have been quite expensive at the grocery stores , so thankfully, the limes were on sale and Dennis’ girlfriend let me borrow her electronic juicer (for the limes). Because I couldn’t find a website that has the recipe and methods listed, you can find the instructions for the Homemade Lemonade (courtesy of Canadian Family Magazine) below. Ingredients: 2 cups of freshly squeezed leon juice (8 large lemons), 3/4 cups superfine sugar (or to taste), 1 pint raspberries, 4 cups of hot water. 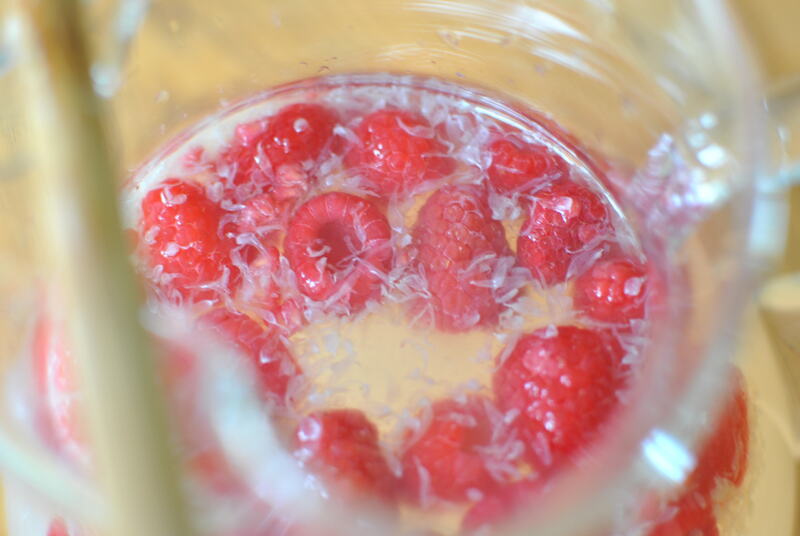 Method: Place juice, sugar and rasberries in a pitcher. Pour water over all ingredients and stir until sugar is disolved. (Refrigerate overnight for a deeper colour.) Pour through a fine sieve and discard solids. Serve over ice. I used the same ingredients, but didn’t quite follow the exact steps. I metled the sugar with water to make a simple syrup. Then, I let the syrup cool, room temperature is fine, and mixed that with the juice (limes instead of lemons work just fine, in my opinion). I then mixed the raspberries in and stirred them until I got a light pink colour (from the raspberries). Note that I left the raspberry seeds and the lime chunks ( from juicing the limes) in the pitcher that I was serving them in. I also made Chai Mango Lemonade but forgot to snap a few pictures from the barbeque. It’s also delicious. I got many compliments from both lemonades.